The "construction camp" was originally built in 1972-73 to house a complement of 110 members of the Seabee battalion NMCB-71 who were building the domed station (before then, the Seabees lived in the emergency camp Jamesways at the old station). 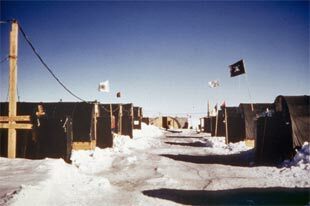 The camp was being built during my brief FNG visit to McMurdo that season...and I heard a fair bit of scuttlebutt in town wondering why Seabees were spending half of the season building the camp (inaccurate...and of course the camp was needed). These two color pictures were taken during 1973-74 by former VXE-6 member Bob Nyden who spent a bit of time at Pole in the early 1970's. The photo at right is from junior electrician Kenny Trostle, who was there in 1972-73. 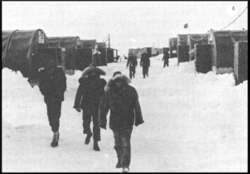 He reported that both jobs--working on the new station and building the construction camp--were going on at the same time. He ended up being a shuttle driver, and he went back and forth between Amundsen-Scott station and the new construction sites twice a day until the construction camp was inhabitable. 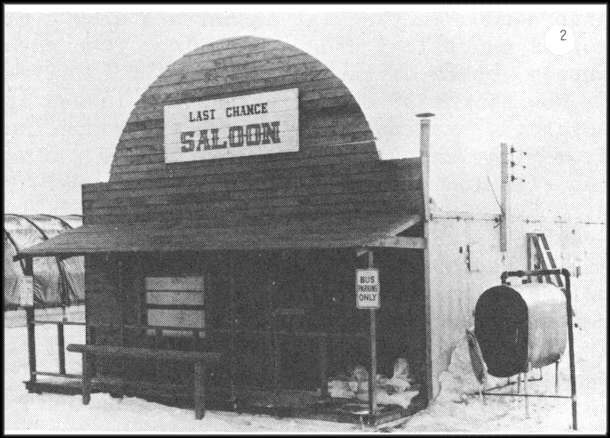 Of course, the Last Chance Saloon is visible in the background. The camp was used to house military (and later civilian) construction workers up through the project completion at the end of the 1974-75 season. Above is a view from that year looking down the street--the power plant is at the far end of the street, with the Last Chance Saloon to the left of it and the galley to the right. 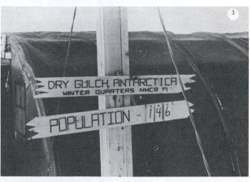 The above photo is from Elena Marty, with Jerry next to the "Dry Gulch Antarctica" sign. 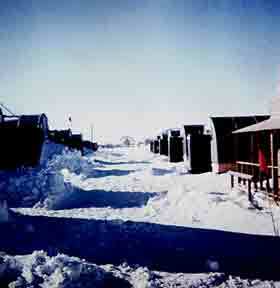 At left is another view of the camp (from Jerry). 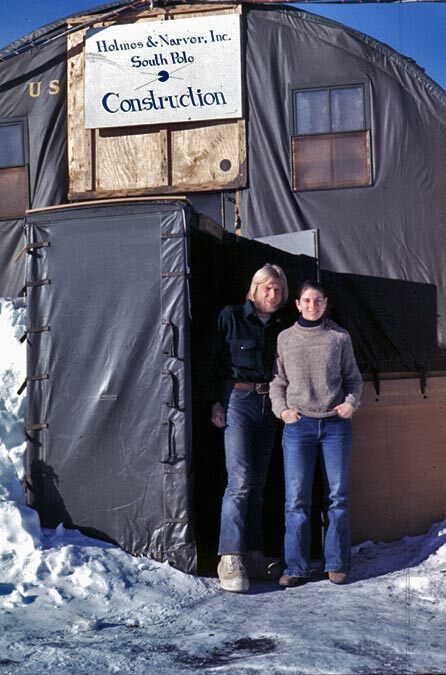 And at right is a shot (also from Elena) of her and Jerry in front of the construction office Jamesway somewhere along Main Street. 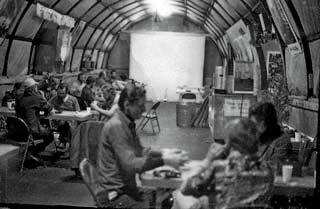 The camp was not opened in 1975-76, primarily because the construction and science schedules had been severely curtailed by the aircraft crashes at Dome C. In 1976-77 the camp was in the process of being opened when it was hit by two fires on 30 and 31 October 1976, less than 24 hours after I and our 1976-77 crew arrived to start the summer season. The first was a small electrical fire in one of the berthing Jamesways which rendered it uninhabitable. The second fire the next day was a spectacular blaze which destroyed the head/galley complex (left, 1974-75 photo from Jerry Marty), which we were in the process of putting in operation to help feed the huge summer crowds we were expecting (60-80 folks (!)). Below, a couple of old 1973-74 photos of the place in use...these are among the many negatives that a friend found a few years ago in Old Pole, and I've attempted to clean these two up a bit. Remember that they had been lying around in Old Pole for 50+ years (!). The mess room side...looks like it is nearly movie time, as the screen is down. The galley side. Given that there is no food out (and the movie screen is down)...looks like the galley staff and mess cooks are cleaning up the place after dinner. 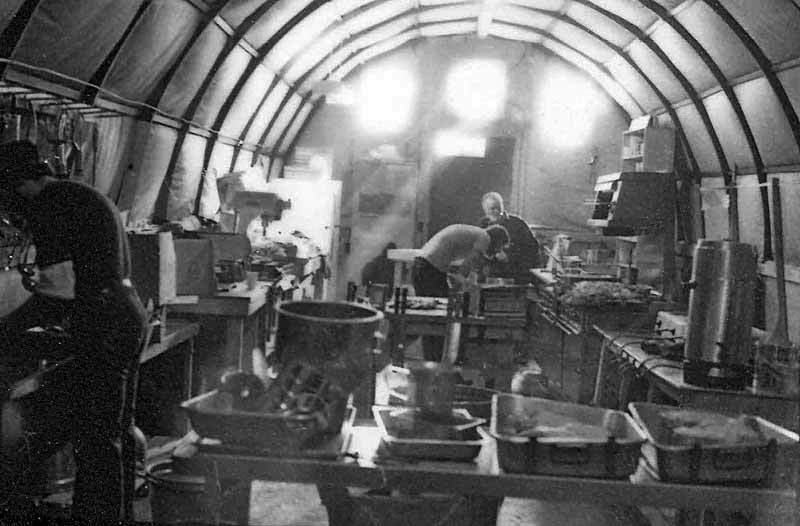 As a result of the fire, the decision was made to feed the entire summer population from the galley inside the dome (a practice that has continued through the life of the dome galley). 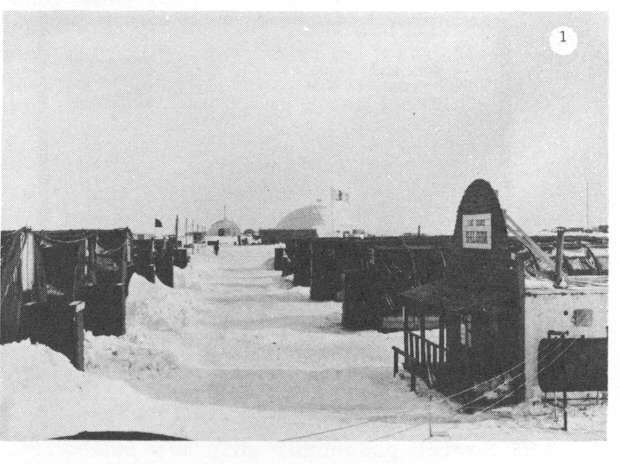 A new "emergency" head/galley and berthing complex was constructed closer to the dome, and the remaining undamaged Jamesways were dismantled for use elsewhere. 1. 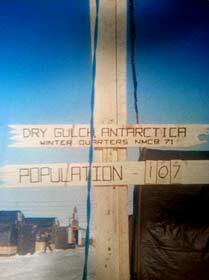 Dry Gulch City, South Pole, Antarctica. Welcome to the last frontier -- "Dry Gulch City"-- where it's always cold and the air is dry because we're at just over 10,000 feet altitude at the bottom of the world. 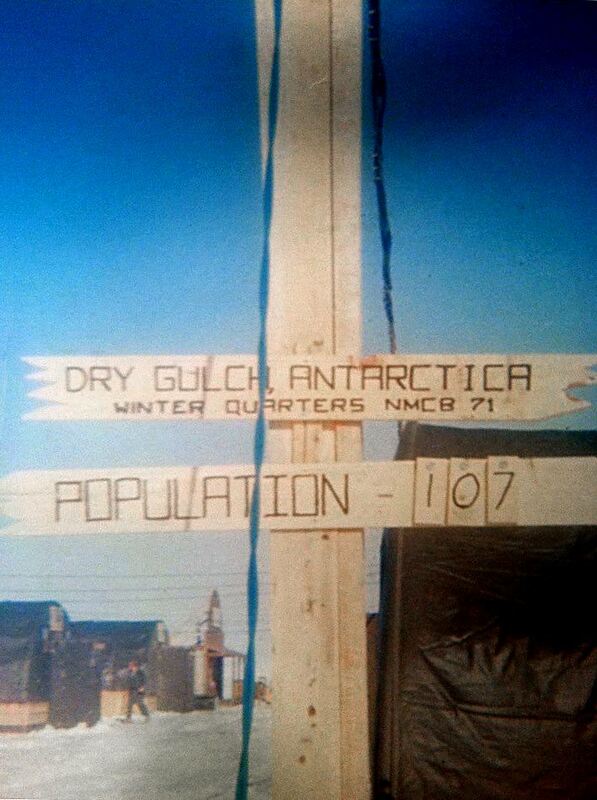 Lt-Cdr Richard Carlson, from Butler, N. J., is the mayor of Dry Gulch, which has an average population of some 120 Seabees of Naval Mobile Construction Battalion 71 in its eight buildings. 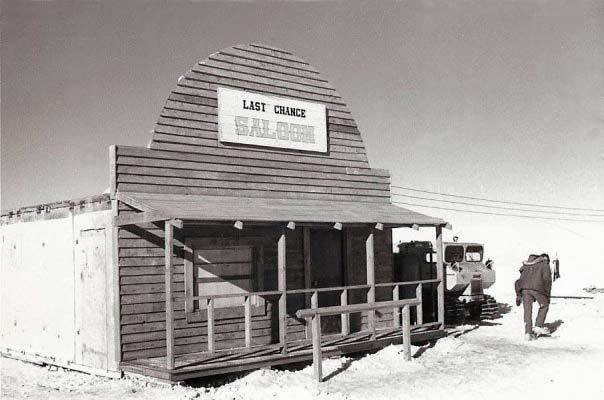 When one ventures around the city you see such rustic sights as the famous "Last Chance Saloon" where the Seabees spend a lot of their off time; the "Court House," or headquarters building where the city's paperwork is done; and surrounding sites. 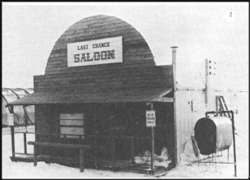 If the men don't go to the movies, then they are likely to head for the "Last Chance Saloon" where there is always excitement. Sundays are a day of relaxation for most of the Seabees. However, there are a select few whose talents are needed: the chef and his staff work with dedication, and of course the bartender is on duty at the Saloon when it's open after work. Towards the end of this deployment in Feb. (1974), "Dry Gulch" will be a ghost town as the NMCB-71 Seabees return to Davisville, Rhode Island. 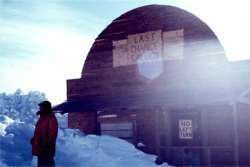 It will be the end of a town constructed to withstand snow, 100 mile per hour winds and temperatures of minus 80° and lower, but there will be left in its place a new station for U. S. scientists who will continue to probe for science at the bottom of the world. The good and the tough times at Dry Gulch City will be only memories to the Seabees with NMCB-71 after this season and will certainly provide a number of "sea stories" for many years to come. 2. Seabee Ingenuity. 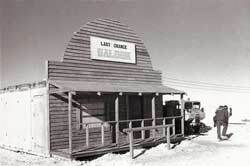 Looking more like Miss Kitty's Longbranch Saloon in Dodge, the Last Chance Saloon in Dry Gulch, Antarctica is the favorite place of the Navymen serving in support of science on the Great White Continent. 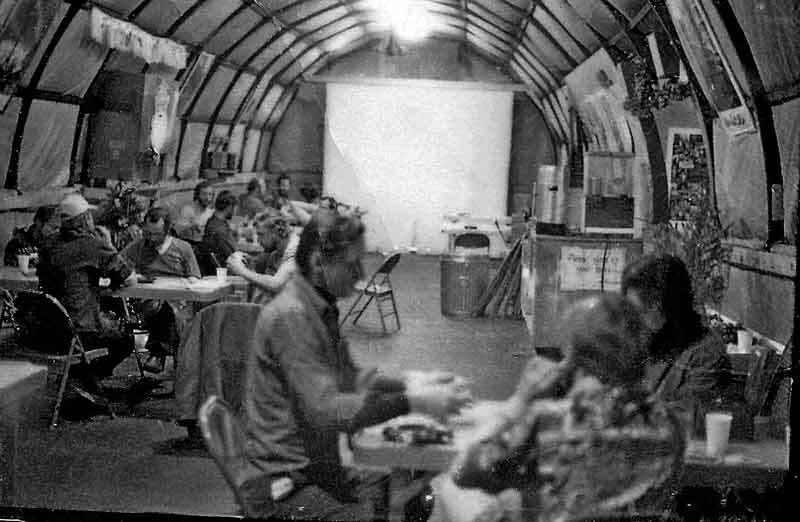 It was designed and built by the men of Naval Mobile Construction Battalion 71 from scrap materials, old packing crates, or anything else they could find. 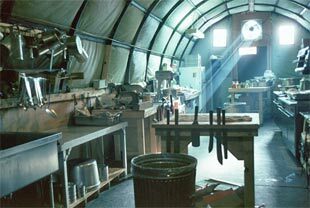 Everything is handmade, including the furniture. 4. Home at the end of a long day. Members of NMCB-71 trudge through the main (and only) street in Dry Gulch. 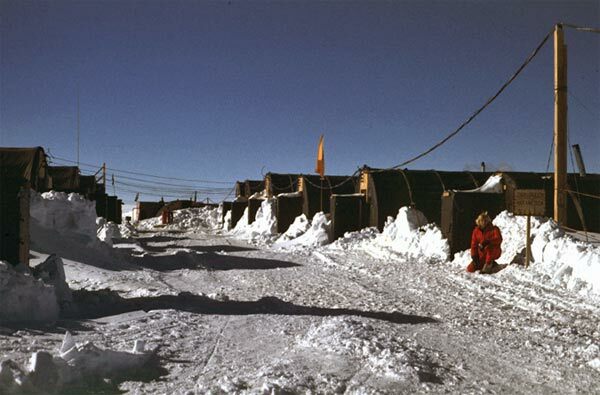 This construction camp is the home of these Navy Seabees during the austral summer during their deployment to the South Pole at the Bottom of the World. --the above is from the Ice Cap News, May-June 1974. This journal was (and is) published by the American Society of Polar Philatelists (ASPP). This copy is courtesy of Billy Ace Baker. 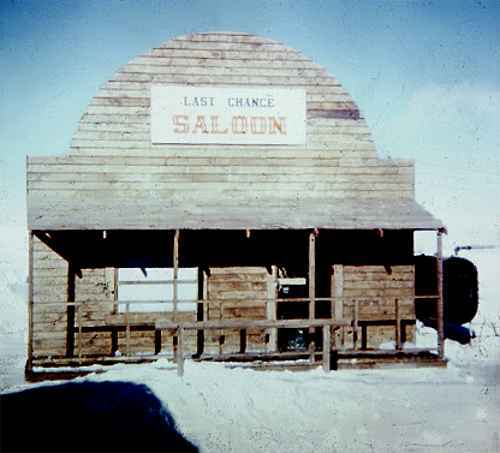 This photo of the Last Chance Saloon is from Gerald Davis, one of the 1973 winterovers, who describes this as the second best bar at Pole.